(Newser) – Few have heard of Henry Peter Bosse, but his 19th-century photographs have earned a home in a federal vault—and a single album is worth $4.5 million. Sotheby's recently appraised the album, which illustrates the changing Mississippi River in the 1880s, and its value had quadrupled over 20 years. But the album's history isn't so illustrious: It spent more than 50 years on a dredge vessel where it appears to have been barely noticed, the Star Tribune reports. 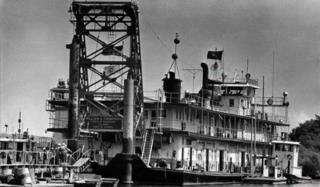 Ken Burns should do a documentary on the Mississippi River using that treasure trove. Unless it SELLS for $4.5M, it's not WORTH $4.5M.